Epicstream is currently not available for new subscribers. Consider other options from here. Epicstream can be considered one of the backbones of IPTV. Many notable IPTV providers get their TV channels straight from these guys. Only recently did they open up their service to end users under their Boss TV brand. And one thing is for sure: You get the highest quality from Epicstream. Crisp HD streams and one of the best EPGs on the market make this a favorite among seasoned IPTV users. Epicstream is currently not available for new subscribers. Consider other options from here. Epicstream initially was a supplier of TV channels for other IPTV services that did not sell directly to end users. However, this has changed with the introduction of Boss TV. This is their new service geared at streamers to subscribe directly to their trusted streams. Since they control their channels and sources, issues are quickly fixed and up-time is phenomenal. Epicstream is available in three different packages, all priced identically. 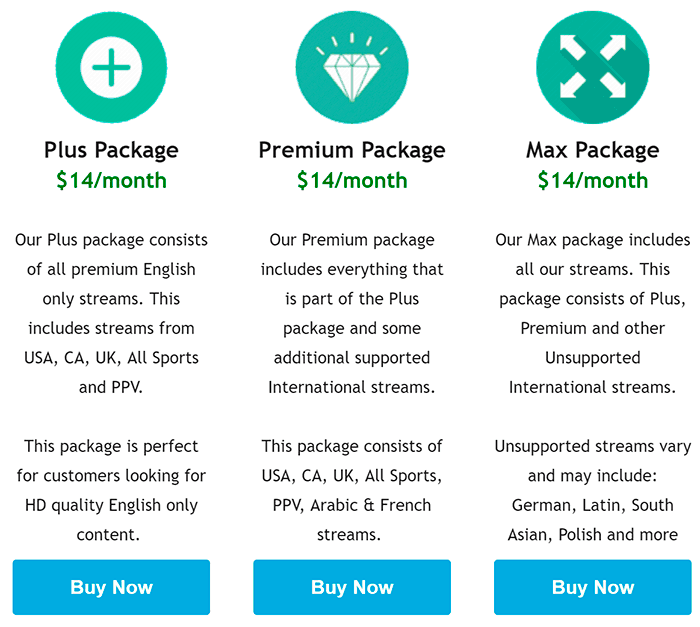 Plus Package – Contains only English streams, all in great quality. This is ideal for those seeking only English content and Sports/PPV streams. Premium Package – Plus package as well as Arabic & French Canadian. Max Package – All of the above plus additional International channels. Epicstream explicitly points out that these are best effort streams and may not be as reliable as their core channel list. Regardless of which package you choose, you’ll pay the full subscription price. We actually like the option to have a slimmed down channel list. Why bother zapping through Italian, French or Polish channels if you don’t speak the language. The Plus package has all the channels you’ll ever need in English. All of these packages also give you access to an impressive VoD section with movies, box sets and TV series. There are certainly cheaper options on the market. But, you do get great looking channels in HD that run really smooth. The number of channels that you’ll be able to access depends on the package you subscribe to. The Plus package contains around 600 premium TV channels from US, UK and CA. This also includes Movies, Kids and around 150 Sports networks. Quite unique to Epicstream is the availability of some channels in Full HD and 60 fps. Especially the latter is a game changer when watching fast paced action movies or sports. Premium package adds another 450 channels from the Middle East, France and Germany. Finally, Max throws in additional 800 channels from Italy, South America, Eastern Europe, India and Pakistan. A limited number of channels on the Plus package (including Sports channels) have timeshift enabled, allowing you to catch up on past shows. The VoD section has around 400 TV show episodes ready for streaming whenever you want. Additionally, there are over 100 movies available, with more being added as they hit the cinemas. Quality and reliability is where Epicstream truly shines. If you want to experience the full potential of IPTV (which of course won’t be able to compete with expensive cable subscriptions any time soon), give Epicstream a shot. Full HD TV channels and 60 fps streams require a good internet connection on your part. But if you can cope with the bandwidth requirements, these channels will blow you away. During our extensive tests (i.e. watching TV), the quality of streams truly impressed us. Most channels are HD and not overly compressed. We didn’t experience any major hiccups. In short: We had a really enjoyable time browsing their channels. This is definitely one of the main services that we use regularly now. Compatibility is on par with other providers. You get the usual options of accessing Epicstream via Stalker devices, such as the Dreamlink T1+, or use their M3U playlist with a wide range of players and devices. Whether you have a Fire TV, Kodi running on your PC or a cheap Android TV box, streaming from Boss TV is a breeze to set up. However, one thing worth noting is that you can’t use both the Stalker portal and m3u playlist. At the time of signing up, you have to pick either. If you intend to use an Android box with STB Emulator, make sure that it runs smoothly. Because you won’t be able to just switch over to e.g. Perfect Player or Kodi (which use m3u). If there is one flaw with Epicstream, it’s this.. Regardless, once you picked your subscription, even newbies will have no issues getting up and running within a few minutes, thanks to an extensive help section.